I’m making a bunch of chopsticks (72 pairs) for Christmas. I decided that my Rigid sander was going to be too akward to do so many and after reading some reviews, I picked up this little machine. I had to order it as none of the Big Blue Box Stores in my area carried one in stock. I was home when it was delivered and heard a crash as the driver of the Brown Truck dropped it in the truck. Sigh. I opened the garage so he wouldn’t have to carry it up the stairs to my front door. Or was it so I wouldn’t have to carry it back down. ;) The thing is surprisingly heavy. Needless to say the, packaging was somewhat damaged. The unit looked okay. Setup/assembly was fairly simple. Just the aluminum worktables and the dust collection adapter. The miter guage, whlie cheap, does the job. I did put some tape on the bottom of the rail so it wouldn’t vibrate off the table. It was quite loose. The first couple times I started it, I needed to give the belt a little push to get it started. It ran somewhat slow for a short while and then reached a higher speed. A few more starts that began slow and sped up after a handful of seconds. Starts fine now. I’m assuming the lubrication had hardened a bit and needed to be broken up. Who knows how long it sat on a shelf somewhere. After about 6 hours (at 8 pairs an hour) of using the belt, I’m fairly happy. My only complaint is that the dust collection is only fair. 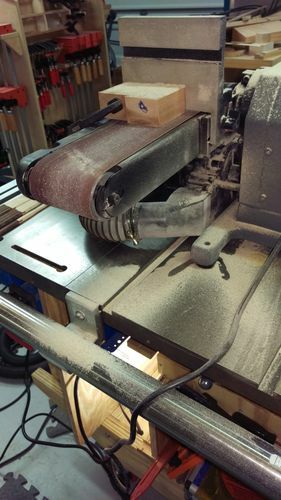 I am sanding a couple inches from the worktable, so some of the dust is because I’m too far away. But there are dust patterns around that shows that the dust collection system has gaps. The is a fair amount of positive pressure coming out of the dust port, so it’s not relying on having a DC hooked up to it (which may be why the gaps are obvious). There appears to be plenty of channeling inside the unit for collecting dust. I may have to check the dust level in my collector. Also of note, you need to be able to access 3 sides of the machine, so mouting it to a bench is probably a no-go. A cart would be better. I’ve had one for about three years and, like you, have found the dust collection leaves a lot to be desired. The only other fault I have found, which you probably haven’t discovered, is that the table mounts are pretty flimsy and you have to be VERY careful when sanding something thick or the sides of the work will not be at ninety degrees to the face of the piece. For that reason I believe I would give it three stars, at most. Generally, I use the Rigid sander for most tasks. Lazyman, the belt lays flat. Here’s a photo of my chopstick sanding setup and dust from an hour or so of sanding. Some of the dust, such as that on top of the machine is because the wood block is diverting the dust off the belt.